Join us for a taste and tour! We are open Tuesday through Sunday from 12-5pm. 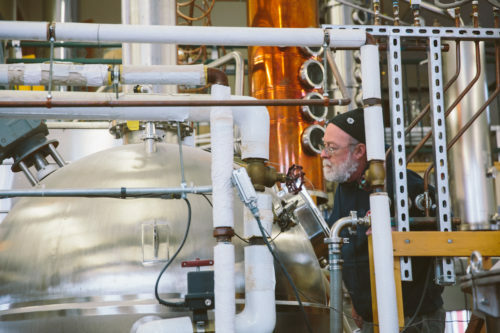 Caledonia Spirits distillery is a working manufacturing facility where the emphasis is on distilling and bottling Vermont’s finest spirits. You will see our elaborate stills and fermentation equipment and meet our talented team. Visits to our distillery are both authentic and informative. We have a cozy tasting room and retail space, where we welcome you to taste our award winning spirits. Tastings and tours are free and available 6 days a week from 12-5pm. No appointment necessary; however, we do encourage groups of 8 or more to contact us in advance. In addition to our award winning spirits, we offer a variety of other Vermont-made items including spirits from Boyden Valley, Eden Ice Cider, and Vermont Distillers among others. We also offer a selection of unique cocktail accessories and ingredients to outfit the home bar. Hardwick, once a rough-and-tumble granite town, is now Vermont’s agricultural hub. Our town is the southern entrance to Vermont’s Northeast Kingdom, a region known for its rich agricultural history. The Hardwick community is home to a plethora of agri-businesses including Jasper Hill Cheesemakers, Hill Farmstead Brewery, Pete’s Green, High Mowing Seeds, Vermont Natural Coatings, Vermont Soy among others. The Center for Agricultural Economy, located just across the street from our distillery, exemplifies the community’s commitment to a sustainable working landscape. We look forward to sharing our story with you. The Northeast Kingdom has lots to offer!